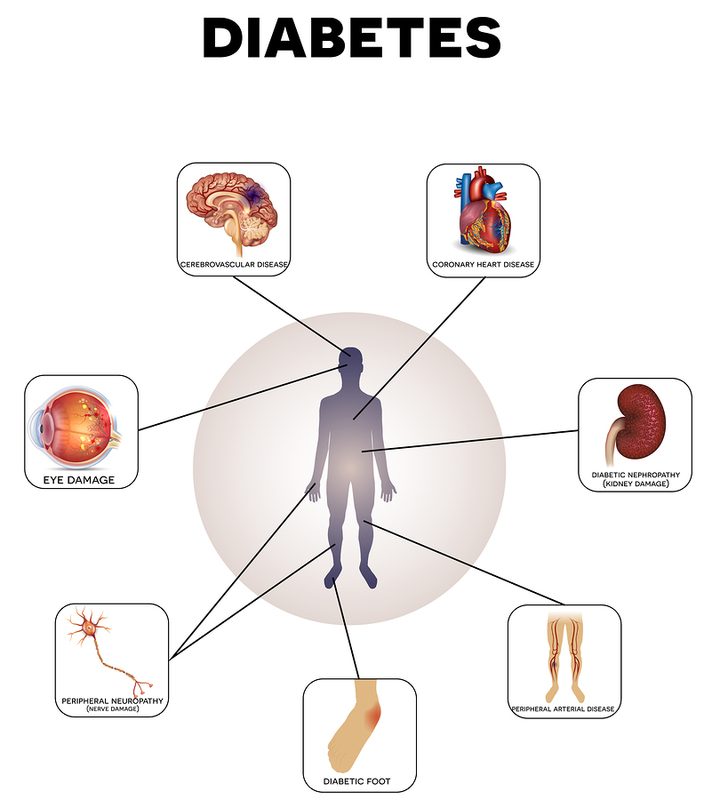 Maintaining normal blood sugar levels is critical to good health and longevity. According to the International Diabetes Federation, a normal blood sugar range for people without diabetes and who are not fasting should be between 82 mg/dL (4.4 mmol/L) and 110 mg/dL (6.1 mmol/L) with 82 mg/dl being optimal. However, you blood sugar levels can vary widely depending on what you eat as well as other health factors like exercise, fatigue, illness, adrenal health and how hydrated you are. Because what you eat is really the biggest factor that effects your blood sugar levels, normal blood sugar levels are reported based on how long it has been since you have eaten. Please note: The international standard way of measuring blood glucose levels are in terms of a molar concentration, measured in millimoles per litre (mmol/L). However, the United States and many other countries express glucose concentrations in terms of milligrams per deciliter (mg/dL). A 2006 study conducted by Dr. J.S. Christiansen found that the blood sugar levels in healthy individuals were quite a bit lower than those commonly recommended by doctors. Specifically, that even after a high carbohydrate breakfast the blood sugar in healthy people does not go over 125 mg/dL (6.9 mmol/L) . In addition, blood sugar levels return back to normal much faster after eating than the two hours after eating measurement that is often recommended. Specifically after consuming a high carbohydrate breakfast blood sugar levels droped back under 100 mg/dL (5.6mmol/L) within one hour and fifteen minutes after eating. By one and three quarters of an hour blood sugar had dropped back under 85 mg/dL (4.7 mmol/L) . This is significantly lower than the current recommendation that blood sugar should be less than 140 mg/dL (7.8 mmol/L) two hours after a meal. Why are normal blood sugar levels important? Blood sugar, also known as glucose, is a monosaccharide and one of your body’s primary sources of energy. The actual amount of glucose in your blood and body fluids is very small - approximately one teaspoon. 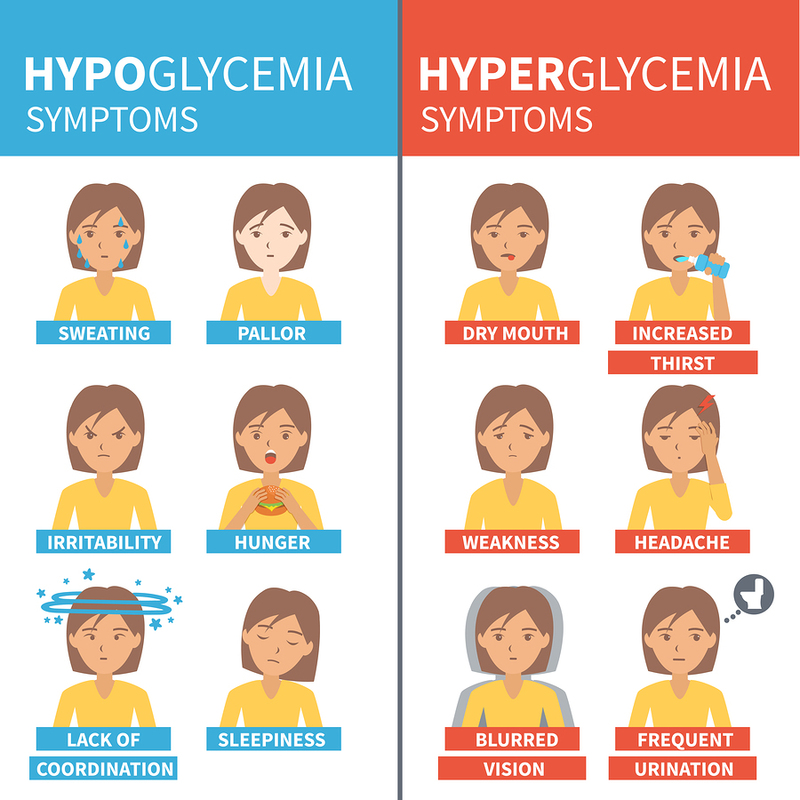 If your blood sugar gets too low, also known as hypoglycemia, then there isn’t enough glucose in your blood to feed your brain and other tissues. When this happens, often due to skipped meals or after excess sugar consumption, it becomes hard for people to think and they may feel shaky. People are generally considered hypoglycemic if their blood sugar consistently falls below 70 mg/dl (4 mmol/L). In more serious situations caused by the consumption of alcohol poisons, or certain medications, infection or prolonged starvation, can result in severely lowered blood sugar (20-50 md/dL) and cause seizures, unconsciousness, brain damage and death. 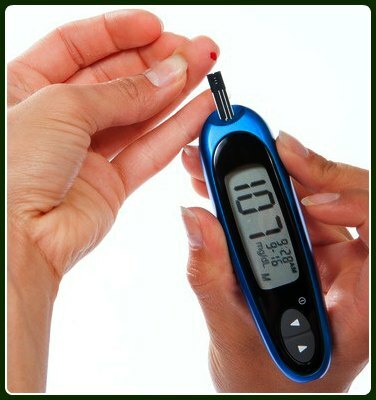 Low blood sugar can be quite a problem for diabetics if they inject themselves with too much insulin. Learn more about low blood sugar. On the other hand, high blood sugar, also known as hyperglycemia, happens when too much glucose is circulating in your blood. Typically you are considered hyperglycemic if your blood sugar goes above 250-300 mg/dl (15-20 mmol/L). If you have high blood sugar temporarily, you are unlikely to have any symptoms. However, if your fasting blood sugar levels consistently stay above 126 mg/dl (7mmol/L) then your blood vessels and organs can be damaged. According to Dr. Bernstein in "Dr. Bernstein’s Diabetes Solution: The Complete Guide to Achieving Normal Blood Sugars" (2003), the longer the glucose molecules are free floating in your blood, the greater the chance they will attach to cell proteins and damage them, resulting in what is known as advanced glycation end products (AGEs), which can cause your tissues and organs to degenerate. 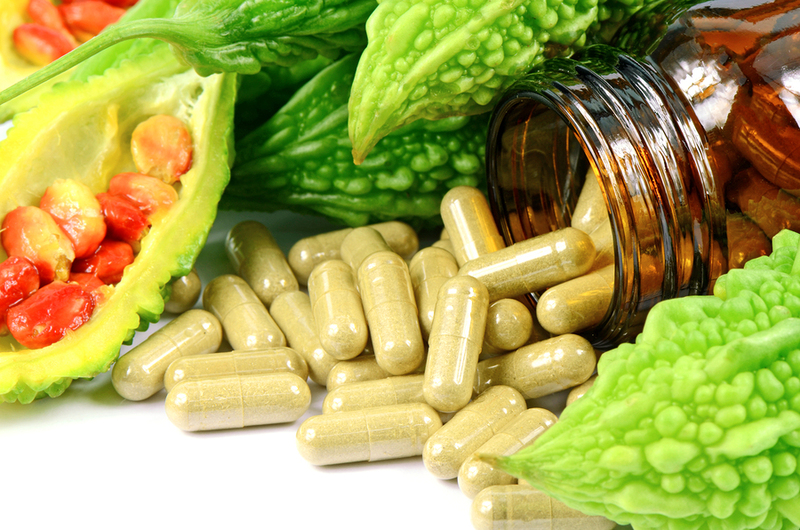 Long term this results in a whole list of nasty things that commonly plague diabetics with poorly controlled blood sugar like cardiovascular disease, impotence, kidney failure and premature death. Learn more about high blood sugar. Your blood sugar levels fluctuate depending on what you eat as well as your body’s ability to metabolize sugar. 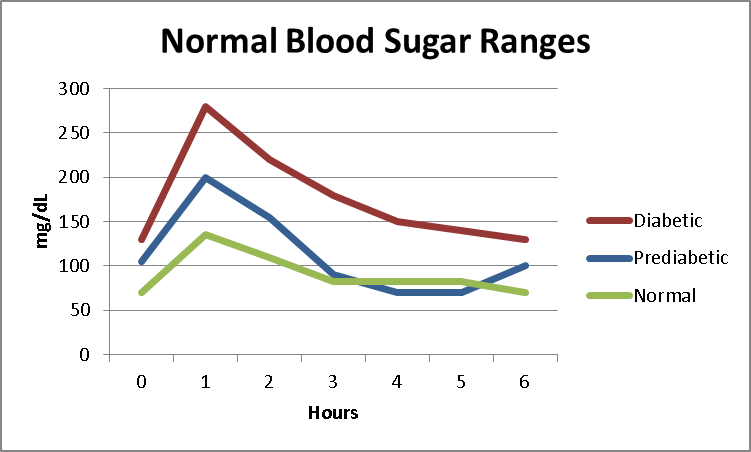 The green line in this chart shows how normal blood sugar fluctuates after a meal. Why do Normal Blood Sugar Levels Fluctuate? Food that is high in simple carbohydrates digest quickly and are rapidly absorbed into your bloodstream. For example, if you drink a glass of apple juice which contains six and a half teaspoons of sugar (26 grams) and no fiber, the sugar in the juice will rapidly be absorbed into your bloodstream. A slice of bread has about 5 teaspoons of sugar in it that will be released almost as fast as apple juice. Recall that the normal amount of sugar in your blood, the amount that results in normal blood sugar levels is approximately one teaspoon. So if the six and a half teaspoons of sugar from the apple juice were to be absorbed into your bloodstream unmetabolized, you would rapidly go into a hyperglycemic coma and die. Fortunately, your pancreas saves the day by quickly secreting large amounts of insulin to process all that sugar. Insulin the hormone that escorts sugar into your cells where it is used as energy. Your brain and your muscle cells use the most energy. Your cells only have a limited capacity for sugar to enter. Having too much sugar in a cell would be like trying to overfill the gas tank on your car. Your cells can only store a small amount of glucose. Excess sugar is stored as fat. After insulin comes to the rescue and shepherds the glucose out of your blood and into your cells, your blood sugar levels rapidly drop. In this example, because you only drank the apple juice with no other food, your blood levels would spike quickly and then drop rapidly due to the action of insulin. This spike followed by a rapid drop in blood sugar will often cause you to feel ravenously hungry and may even make you temporarily hypoglycemic and cause you to feel shaky. What? You say you feel ravenously hungry most of the time? Guess what? That’s likely because your blood sugar levels regularly peak and then fall rapidly after you eat a meal full of simple carbohydrates (sugars and starches). One of the nice things about maintaining normal blood sugar levels is freedom from hunger. If you want to be free from constant hunger, try eliminating all of the simple starches and sugars from your diet for a couple weeks. Not only will your blood sugar levels normalize but you can enjoy the delightful feeling of being free from constant hunger. The above example was extreme in that no other food was eaten. However, the same sort of thing happens any time you consume carbohydrates (sugars and starches) without also eating plenty of fiber, protein and healthy fats to slow down the absorption of sugar into your bloodstream. This is also why one of the best things you can do to maintain normal blood sugar levels naturally is to eat fewer simple carbohydrates and more protein, healthy fat and green vegetables. Simply ensuring you eat some form of protein (eggs, chicken, beef, lamb, etc) at every meal can help your body maintain normal blood sugar levels. However, if you still experience symptoms of low blood sugar or symptoms of high blood sugar, when eating protein at every meal, you may need to get more serious and try eating a low carbohydrate diet for a period of time in order to get your blood sugar back to normal.